Can I purchase a subscription to watch Pac-12 Networks directly from Pac-12 or Pac-12 Now for online-only viewing? Pac-12 Networks does not currently provide an a-la-carte, internet-only subscription option. However, we do provide online access to all of our broadcast TV content across all seven of our channels, including live events, through our providers via TV Everywhere service. To access all seven channels, download the Pac-12 Now app (for iOS and Android). For more information on the Pac-12 Now app, please visit this page on Pac-12.com. If your TV provider does not allow for TV Everywhere access, we would recommend reaching out to their customer support to inquire about your options. You can find customer support contact information for several of Pac-12 Networks leading providers here at Pac-12.com. 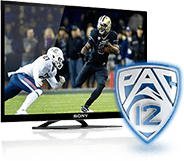 To receive Pac-12 Networks, anywhere across the United States there are multiple options and providers for fans to access our channels and content. To see a list and be connected with one of the multiple options in your area, please visit GetPac12Networks.com and enter your zip code in the channel finder. If my TV provider does not carry Pac-12 Networks what are my options? Will you reach an agreement with DIRECTV? Can I view Pac-12 Networks on Google Chromecast? If I am a DISH customer, can I watch Pac-12 Networks on the internet or through mobile devices? Can international viewers access the Pac-12 Now app or online at Pac-12.com? © Copyright 2014 Pac-12 Conference. All Rights Reserved.